Fourth Row Center: Film Writings by Jason Bailey: In Theaters: "Project X"
If I were 14 years old, I’d think Project X was the greatest movie I’d ever seen. At 36, let’s just say I have some reservations. The film’s biggest problem—indeed, the one that will prove a deal-breaker for most viewers of reasonable maturity and intelligence—is that the entire endeavor is based upon audiences finding utterly irresistible a character only marginally less detestable than Patrick Bateman. Get past him, though, and the by-the-numbers first act, and it must be said: the manic energy of the picture’s central event is infectious. There is fun to be had here, but as with a good party, you won’t feel very good about yourself in the morning. 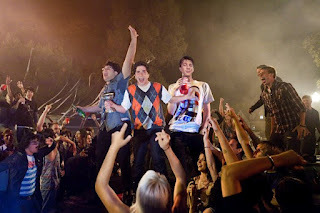 In a nutshell, Project X is a “found footage” Superbad (if it wasn’t pitched like that at least twice, I’ll eat my hat), with Thomas Mann its JV Michael Cera, and Oliver Cooper a fourth-rate Jonah Hill. Make that fifth-rate. Thomas (most of the film’s actors have the same names as their characters) is a high school loser who’s celebrating his 17th birthday; “Costa” (Cooper) is his best buddy, who has decided, since Thomas’s parents are out of town, that they’re going to throw an epic birthday party. “This party is gonna change everything for us,” Costa insists, and that it does. Though faux cell phone and Flip-cam videos are occasionally used (the film opens with a fake disclaimer that thanks “everyone who contributed footage” and apologizes to all parties), most of the film is footage from one camera, run by a Goth A/V geek whom Costa has engaged to document the party and events leading up to it (he gives it the “Project X” moniker for no discernable reason, except to make for a film that will confuse fans of the Matthew Broderick save-the-monkeys movie). As per usual in the lazier faux-documentary efforts, the camera is always around the right corners and peeking through the right windows, and is blessed with what must be the greatest condenser microphone in audio history. The gimmick doesn’t add anything; it appears to have been used because that’s what the kids like these days. These are serious issues. But the funniest thing happens once the party proper gets underway: the movie starts to work. The events preceding it have been so unremittingly predictable that when the surprises come, they have some extra force (there’s a great bit with a complaining neighbor, for example), and the picture’s loud, fast, raw style sweeps the viewer along. It’s all in horrifyingly bad taste, of course, but by that point in the movie, we’ve grown inured to all the casual misogyny and vulgarity—we’re mostly just relieved that it’s not as bad as it was in those opening scenes. And I must confess a sort of grudging respect for how far it ultimately goes, almost as if on a dare; You want out of control? the filmmakers seem to ask. Here’s out of control. “Found footage” or no, it’s not believable for a second (yeah, sure the police captain would tell a TV news crew, “We’re gonna have to let this thing burn out before we move back in”), but you must give them this: they see it through. Once the party’s over, though, the movie is too, and it sinks badly with a wrap-up that’s insultingly brief and easy, and a final bit of idolatry for the picture’s most revolting character. Project X isn’t worth seeing, not really. But it has its moments of inspiration, and its target audience is gonna eat it up with a spoon. "Project X" opens tomorrow in wide release. Saturday Night at the Movies: "The Interrupters"
In Theaters: "Last Days Here"
In Theaters: "This is Not a Film"
On DVD: "I Melt With You"
New on Blu: "Vanya on 42nd Street"